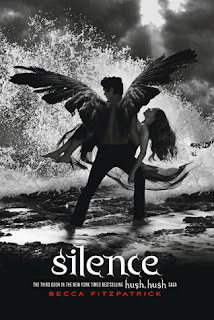 Fitzpatrick delivers the breathtaking third book to the "New York Times"-bestselling Hush, Hush saga. Armed with nothing but their absolute faith in each other, Patch and Nora enter a desperate fight to stop a villain who holds the power to shatter everything they've worked for--and their love--forever. So I know it seems I've been reading a lot of Fitzpatrick, but I swear, once the last book comes out I'll be finished with it. It's just that Patch is amazing. I went to Barnes and Nobles the other day and I say Hush, Hush on display in the recommended section. Underneath it in the little comment box they have, it said, "Patch is the badass Edward wishes he could be." And yeah, I totally get that. He has that whole cool dark, mysterious bad boy thing going on that just so.... so..... *swoon*. See, I lack the words to describe my feelings for Patch right now, so I'll just move on. I have to admit I hated the beginning of the book. You quickly learn that Nora has lost all of her memory since the last book. Everything that's ever happened to her that includes Patch, fallen angels, or nephilim (did I spell that right? ), is completely wiped out. I was teetering on the edge of insanity and frustration to get to the end of it, but as you can see I did. And I have to say the ending really redeems itself. It's starts off a bit oddly but gains its ground quickly. Eventually, I thought it was kinda cool that I knew more than Nora did (although, that normally happens anyways, she's not that bright of a character). There are still those moments when I couldn't help but groan at the situations she gets herself into, but that's what made this book so great. With Hank and Scott bother returning the stakes are higher and mystery is deeper. I really got into it and voiced my frustration during the good times and the bad times. With the ending they give I can't wait to see how Nora and Patch's relationship plays out in the last book. Finale better be awesome or I'm going to be very upset.